DI MARE - Al Grissino è un rinomato ristorante di pesce di Milano situato in Città Studi. 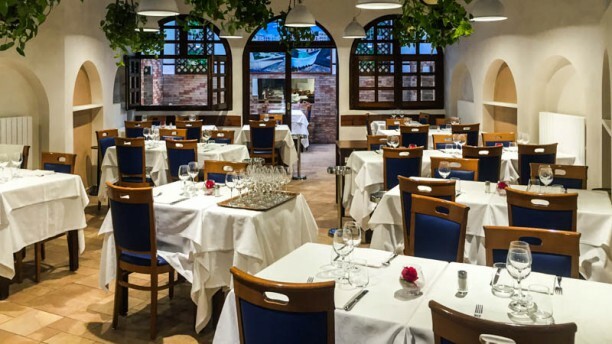 Un ristorante con tantissimi anni di storia alle spalle, la cui attuale location, ricca di verde e arredata in stile classico, riserva alla clientela un’atmosfera informale e rilassata in cui godere di una gestione cordiale e professionale. DAL MENU - La cucina offre specialità di pesce, crudi e marinati, preparate dallo chef utilizzando soli arrivi giornalieri per garantire il meglio a tavola. Tra le portate più richieste sono assolutamente da citare gli Spaghetti alla "Grissino", i Tagliolini al riccio di mare e la Tagliata di cernia alla Grissino con carciofi. Ottima anche la selezione dei vini, con un’offerta che conta circa 60 etichette selezionate. OCCASIONI DIVERSE - Per una bella serata in famiglia o con gli amici Al Grissino è certamente l’indirizzo giusto: atmosfera conviviale e qualità a tavola saranno i must della vostra cena. One of the best restaurants in Milano I have ever been to. The other good one is Paper Moon in the Center. But Al Grissino really very good ! Al Grissino was among our 2 favorite places in Milano. Excellent food, very friendly and caring service, cosy family atmosphere. We enjoyed an assortie of starters, which was followed by home made pasta and finaly - delicious fish. Nonna’s cake was amesome! We’ve been to some restaurants in Milano with same seafood concept, but none of them rival Al Grissino. Definitely a must visit place in Milano! The service was extremely slow. We only ordered 2 appetisers (3pcs oysters and the mixed carpaccio seafood) and 1 sea urchin pasta, and 1 tiramisu - in total it took more than 2 hours for all the dishes to come out , and another half an hour to get the bill. The sea urchin took more than 1 hr (after we had already finished the appetisers) and the tiramisu more than 20 mins, and it wasn’t worth the wait. The mixed carpaccio was disappointing with only 2 types of fish and 1 PCs langostine ans 1 PCs shrimp. Probably the leanest “mix” I’ve had in Milan. The oysters were nothing special. The sea urchin pasta was unappetising. It was literally pasta with oil and a few PCs of uni - it was not creamy uni pasta with uni sauce. I would not reccomend this restaurant and there are tonnes of better choices if you want seafood in milan and at the same prices. Really disappointed and a waste of an evening just sitting around waiting for mediocre food. Al Grissino is an instition in Milan for fish lovers. You never get disappointed. Overall good experience but I won't go there anymore on Saturday night as the restaurant is too crowded. I have been there during lunch in week days and the quality of service was good, our waiter was alone to serve too many people at the same time thus he did his very best. Very good quality of food. Without your offer standard price would have been little bit high.